I was in Las Vegas last week speaking on New Marketing Mastery at Tony Robbins Business Mastery and as always when I’m in town I take in the Fountains of Bellagio multiple times. The free show happens many times per day and is one of the top attractions in the city, driving people into the luxury hotel’s high-end shops, restaurants, and casino tables. I was thinking about how the Fountains of Bellagio are a perfect bricks and mortar metaphor for giving away content on the web to drive people to your virtual storefront. 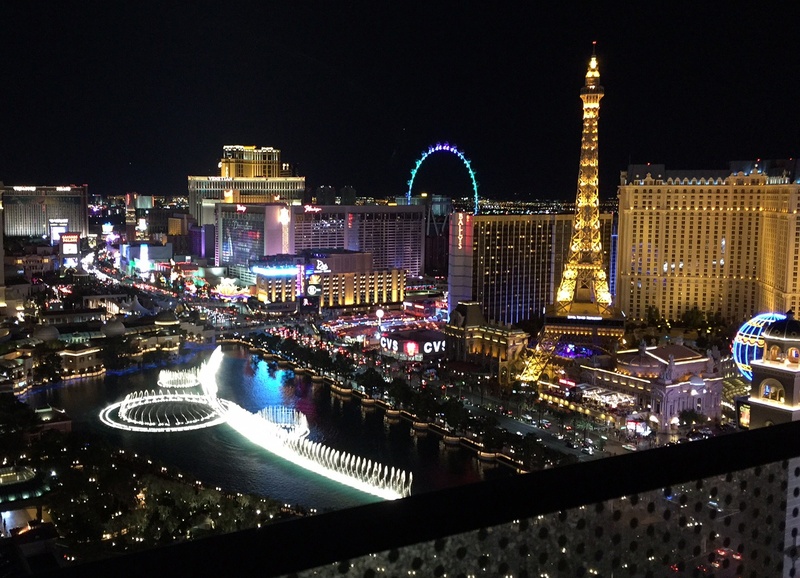 On last weeks’ visit, the Business Mastery event hotel was directly next door to the Bellagio and I was fortunate to be in a room with a balcony and an ideal view of the spectacular water and sound extravaganza. (The photo in this post was taken from there). My wife and my mother joined me on this visit to Las Vegas and we decided to eat at one of the pricey restaurants in the Bellagio. I have no doubt that my mother preferred this because the fountains mesmerized her as well. It’s absolutely true that each show is different. Last week I saw perhaps a dozen shows, mostly from my balcony in the evenings with a glass of red wine. It’s not just me who geeks out about the fountains. The Fountains of Bellagio are rated the number one attraction in Las Vegas according to Time, are the TripAdvisor number one attraction in Las Vegas, and a USA Today ten best attraction. In its first ever Travelers’ Choice awards several years ago, TripAdvisor named The Fountains of Bellagio the nation’s top landmark. Imagine that - the top landmark in all of the United States! Tons of people photograph the fountain and many share on social media, generating even more attention to the hotel. Yes, the water takes up a big chunk of real estate and the upkeep on the fountains must be substantial, so it is a major investment for the Bellagio. But it is definitely driving people to the hotel. When we watched the fountains show from the railing along the water, there were hundreds of people gathered. When the show concluded, a large percentage of them strolled into the hotel to check out the shops, enjoy a meal, or play the tables at the casino. Inside the hotel was absolutely packed. It’s the same on the web. Create free and compelling content and use that to drive people into your products and services. Most resort hotels would put a revenue generating property on the real estate where the Fountains of Bellagio sits. And most companies sell-sell-sell from their product centric websites. Resist the temptation to hype products and add value instead. People will be eager to do business with you.